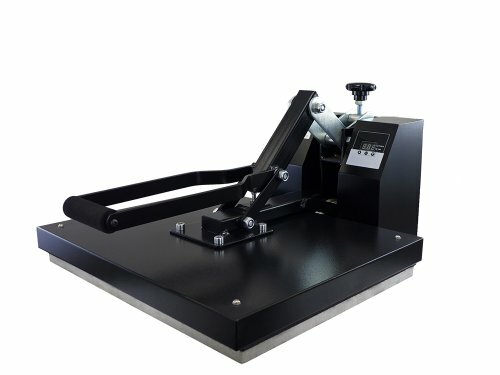 This commercial-grade heat press from Rincons Heat Press has a large 16" x 20" element (actual size 15-3/4" x 19-3/4") that allows you to create custom t-shirts, license plates, and many other unique and fun items. Transfer onto an array of flat surface materials such as fabric, metal, ceramic, wood and glass. Space-saving clamshell design features an elevated, 9/16" thick aluminum lower platen to easily insert and remove t-shirts from the machine. The element is non-stick and Teflon-coated to prevent scorching of transfers and does not require a separate silicone/Teflon sheet. Removable and reversible hi-temp silicone pad. The pressure-adjustment knob allows you to adjust the pressure according to the thickness of the material to which you're transferring. Digital temperature control lets you preset the temperature (in Fahrenheit); the element will stop heating when the preset temperature is reached. This commercial-grade heat press is true 1,600 watts rated with a temperature range up to 500 degrees Fahrenheit. Arrives fully assembled and ready to use with pre-installed Teflon-coated element, removable and reversible hi-temp silicone pad, and operating instructions.